Have family history of heart disease? Have family history of diabetes? 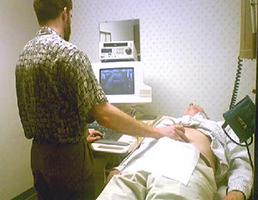 Screening ultrasounds help you and your doctor determine your risk for stroke, abdominal aneurysm and other peripheral vascular disease. The tests are painless, and it only takes 30 minutes to perform all three! You don’t need an order from your doctor, but he or she will receive your results. Peripheral Vascular Disease is a very common condition, and affects as many as 20% of Americans over the age of 65 (or 30 million people). It’s most often caused by plaque that builds up and narrows the arteries. This is known as atherosclerosis, or more commonly known as, “hardening of the arteries.” People with PVD are more likely to have blocked arteries in other parts of their bodies, and are at greater risk for heart disease, aortic aneurysms and stoke. 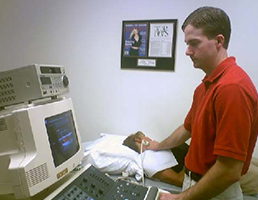 Therefore, physicians recommend Carotid, Abdominal and Leg Arterial screening exams for those risks. Not covered by insurance. Payable on the day tests are performed.